We cats know a secret of our house. Believe or not, there is a monster in our house. It's usually in the storage area under the stairs. I guess the storage is a nest. It looks similar to an Opabinia. Do you know what an Opabinia is? They were creatures that lived in the Cambrian sea. At first, I thought that the monster was a mutant of the Opabinia, but it lives in the storage without any water, so the possibility of it being an Opabinia is low. It's difficult to define the type of creature that has never been found, isn't it? I can understand how biologists experience difficulties. The monster comes out of the storage on a regular basis. I think it comes out to find food. It has three legs and Opabinias had five eyes. Coincidentally, both of them have an odd number of body parts. Then, I recalled a book that I had read long ago. The ancient creatures were born underwater and they expanded the habitat from sea to land. I reconsidered that the monster might be an evolved descendant of the Opabinia. If my guess is correct, I have to write an essay and contribute an article to Nature, meow. The other features are its roar and long tail. It roars so badly and loudly while eating. It has a big body but eats tiny little things on the floor. It's not surprising if it eats something small, because the biggest mammal, the Blue Whale, eats tiny krills. The tail of the monster is narrow as a cord. The tip of the tail has three stingers like a scorpion. Aha, it must be poisonous. We cats have to be very careful when it comes out of the storage nest. The monster seems to be attracted to our humans. It always walks with a human like a dog. Unlike its appears, it may be lonely. My cat family, Mittan and Midon are frightened and have never ever got close to the monster. I think that the monster just pretends to be strong, but there's nothing to be afraid of. All right, I am going to be a friend of the monster. If we could get along well, it won't prick me with its stingers, and I can check what kind of creature it is. Now, what should I do first to become a friend? Maybe I should find out its name. This is a basic courtesy, you know? Hey, human. What is the full name of that monster? What? You must know the monster! That red noisy one that always sleeps in the storage area under the stairs. What? O.K. 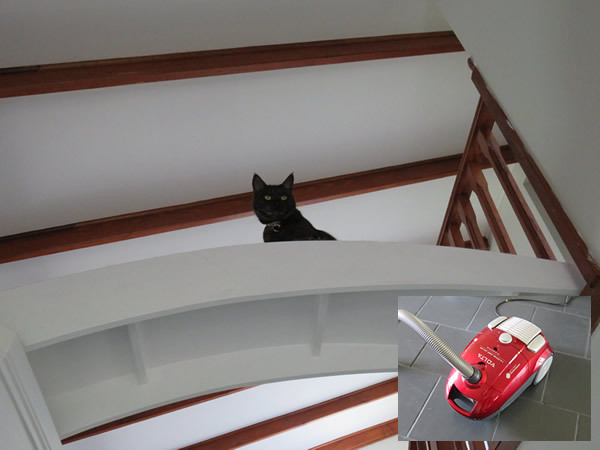 I'm going to be friends with the Vacuum Cleaner, meow.